Summary: Thirty-six-year-old Grace McAllister never longed for children. But when she meets Victor Hansen, a handsome, charismatic divorced restaurateur who is father to Max and Ava, Grace decides that, for the right man, she could learn to be an excellent part-time stepmom. After all, the kids live with their mother, Kelli. How hard could it be? In the past few years, I've read quite a few books by Amy Hatvany -- I think it's four in a little over a year and a half. In fact, I can't think of another author that I've read this much! I always seem to enjoy her novels because they are so honest, and her most recent one HEART LIKE MINE is no different. HEART LIKE MINE explores some very complex family relationships and is told from alternating characters' views. It begins with Grace, a successful 36 year old woman who has chosen to focus on her career and never have children. When she falls in love with Victor, a divorced man and father to Max and Ava, she figures that she can "do" the part-time step mom-thing because she truly believes he's the one. However, Grace's entire world is turned upside-down when Kelli, Victor's ex, is discovered dead. Knowing that she never wanted to be a mother, she isn't entirely sure she's ready to take on two kids who have just lost their mother. In addition to Grace, the story is also told through the eyes of the young teen daughter Ava. Naturally, Ava is distraught over the loss of her mother while also trying to navigate the already difficult world of divorced parents and schools. She isn't about to make things easy for Grace and she's definitely causing some tension Grace and Victor's relationship. In addition, she feels like she didn't really have the chance to get to know her mother and she's determined to learn about her secretive past. Finally, there are some chapters from Kelli's perspective. Since the book begins with Kelli already dead, these chapters are, of course, flashbacks into Kelli's past; and they explain a great deal about Kelli's state of mind as well as her estranged relationship with her family. While I appreciated getting to know this character and liked how these chapters worked to reveal the mystery surrounding her death and her past, I felt that something was a little strange in having chapters from a dead character's point-of-view. I'm not sure how else Kelli's story could have been told differently, but I found it a little jolting at times to go back and forth between present day and a dead character's past. Overall, I did enjoy HEART LIKE MINE, but I have to say that much of the story was very predictable to me. I still felt as if the story was a good one and the characters were definitely interesting. I especially appreciated how the novel explored some tough themes about the complexities of families. 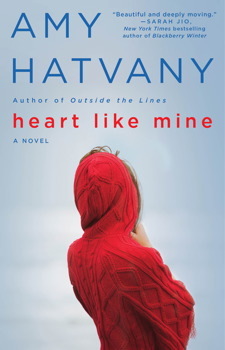 However, HEART LIKE MINE definitely wasn't my favorite of Ms. Hatvany's books -- that honor goes to the first one I read BEST KEPT SECRET. You can read my review here. this motherhood argument. In addition, I thought her portrayal of Ava and her treatment of Grace was extremely real. While parts of this story were almost difficult for me to read because of the characters' pain, I still liked that I could imagine them as being "real" people. I do think fans of Ms. Hatvany's will appreciate HEART LIKE MINE. This novel still encompasses what I've come to love at her novels -- intriguing characters dealing with some very complex (and very real) situations. In addition, I think many women will be able to relate to these characters and their problems. While most women (hopefully) won't experience the the levels of loss and grief that these three did, the difficulties that stepmothers and stepchildren face will undoubtedly seem familiar to some readers. In addition, I imagine that the themes of divorce, remarriage, and family troubles will resonate with many readers. Because HEART LIKE MINE does explore so many relevant issues in today's society, I think it would make a great book club pick. As is the case with all of Ms. Hatvany's books, the characters and their actions are fascinating, and I think many different women will see them (and judge them) differently. Needless to say, these differences in opinion have the potential to provide some stimulating discussion. There is a reading guide available with thirteen discussion questions as well as some ideas to enhance your book club discussion. Some of the themes you might want to talk about include motherhood, divorce, family dynamics, loss, grief, guilt, forgiveness, acceptance, dishonesty, and secrets! Overall, I did like HEART OF MINE but I didn't love it. I still would recommend it to fans of Ms. Hatvany's as well as readers who enjoy stories about complex family dynamics. I've read none of her books, but I am always ten steps behind the trend! Ha! The book sounds like a good, thought-provoking read. Sometimes predictable is just what I need - I'll try to remember this book when that's what I need. I haven't read her either, but this does sound like it would make a good movie! I haven't read any of her books, but I have this one, which I want to read soon. I don't think I've read any of her books. I agree with Kathy, sometimes predictable is perfect.